Quality USB to RS232 serial adapter with the FTDI chipset for best compatibility. 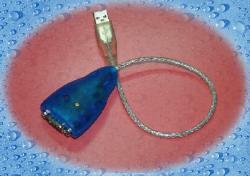 This USB Serial Adapter is designed to make serial port expansion quick and simple. Connecting to a USB port on your computer or USB hub, this USB Serial Adapter instantly adds an RS232 serial communication port to your system with easy plug-and-play and hot-plug features. Plugging the USB Serial Adapter into the USB port, the adapter is automatically detected and installed. There is no IRQ & COM port conflicts, since the port doesn't require any additional IRQ, DMA or memory on the system. The RS-232 serial port functions as a native Windows COM port, and it is compatible with Windows serial communication applications. Cable Length is 10 inches (25 cm).